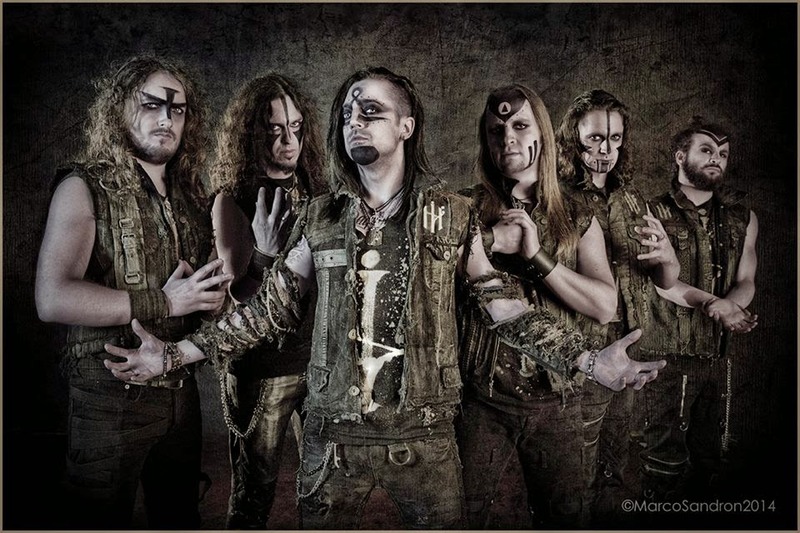 Rock & Metal 4 You: CD-Review: Elvenking - "The Pagan Manifesto"
When I read that the guys of Elvenking recorded a new album I was really excited. Some years ago I discovered this band, that combines Power Metal with folk music and anthemic stadium-sized choruses, topped by a pretty good singer, who has much of dirt and attitude in his voice. It was this mixture that made Elvenking so interesting and always special to me. "Red Silent Tides" is still one of my all-time-favorites and also the follow-up "Era" was packed with amazing songs. It seems like nothing could go wrong with the new effort "The Pagan Manifesto" ... or not? Not every Rocker is familiar with Elvenking from Italy, but within their genre (Folk/Pagan/Power Metal) they are the spearhead to me. Like I said, it's always fascinating how these guys combine so many elements from different subgenres and mix their own cocktail with those ingredients. Not every Elvenking album was a winner, but since "Red Silent Tides" the guys made a huge step forward. Ok, I have to admit their style changed a bit in recent years. "Red Silent Tides" had much more of an Melodic Rock record, where the typical violin has been used less. On "Era" the folk elements played a more important role again without leaving the huge hooks and catchy choruses out of sight. To me this was the perfect symbiosis between older Elvenking stuff and the more new direction. With "The Pagan Manifesto" Elvenking return even more back to their own roots. The Pagan Metal aspects are much more present than on "Era". So, Elvenking die-hards will be very happy to hear that. When it comes to my own taste I'm not so satisfied, because only a few songs reminded me at the two records I mentioned above. Going back to the roots can be a very good thing, but Elvenking overdo it a bit. What I mean is they grip things up again, which are so useless. Things they removed during their development in all those years. On this album decisions were made, that I can hardly understand. Let me give you one example: after their album "The Scythe" I was so happy that they didn't do those terrible growls again ... and now on "The Pagan Manifesto" they have their comeback. WHY? God damned, why they are doing this?! Just to sound heavier, or what? Yes it is a matter of taste, but personally I hate such growls, especially because they don't make any sense in this particular genre. When I like to hear growls I'm listening to Death or Thrash Metal, but why you have to use it on a melodic Power Metal album? At least growls were only used on two tracks here ("Grandier's Funeral Pyre" and "Witches Gather") , but they destroy those songs in my opinion. And if that wasn't enough Elvenking said goodbye to those great anthemic choruses. There are a few highlights on this album, for example the first single "Elvenlegions" (which is one of the songs that could have been on "Era"), the fast "Moonbeam Stone Circle", the hard rockin' "The Solitaire" (although the screams are going on my nerves, but nevertheless it's a cool fist-in-the-air rocker) and the very melodic "Black Roses For The Wicked One", but most of the time we get to hear songs, which seem like they were build on various set-pieces, without a red line in it and also remarkable melodies remain on track. There are many good approaches in songwriting, but unfortunately their potential is not used consistently. The best example is the epic long track "King Of The Elves" (feat. Amanda Somerville on guest vocals), which features some nice melodies, but in the end they lead to nowhere, because the whole song seems way too bulky. You find lots of pretty cool moments and ideas in various songs like "The Druid Ritual Of Oak" or "Pagan Revolution" but finally you don't feel really satisfied. Something is missing, something that grabs you, something that pulls you right in. I'm talking about the hooks, which made older songs like "We, Animals", "The Cabal", "Poor Little Baroness" or "Forget Me Not" so special. Not much stucks in your head here, which is really, really sad. 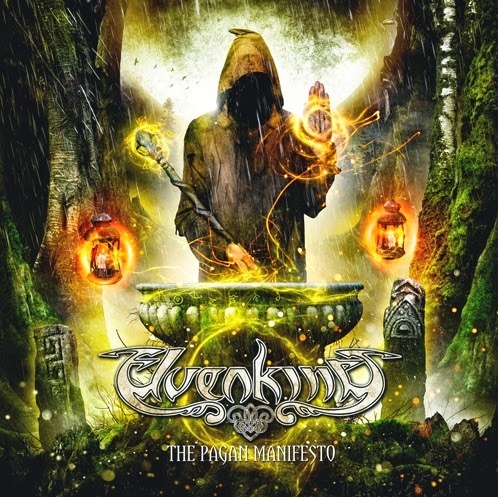 "The Pagan Manifesto" truly feels like an album from the early years of Elvenking, because all the amazing songwriting skills and the very good sense for huge melodies, which they have acquired in recent years, are missing on many tracks. The only thing that remains from the last records is the much better sound: "The Pagan Manifesto" is their best sounding record to date when it comes to production. It is punchy, it has balls and you can hear each instrument clearly. The band itself is also in really good shape, so everything is played and presented very well. I still love the voice of singer Damna, who sounds better than ever on this record - he could easily sing on a Sleaze Metal record, because his voice has this special dirty attitude, that makes the songs more interesting. Speaking about special interest: the mixture between Power Metal and Pagan Metal feels still fresh and is a welcome variety to other bands, so the concept itself hasn't worn off. The atmosphere and arrangements are interesting and you'll always discover something new with each listen, so the presentation, sound and production is very, very good. It's a shame that the songmaterial can't keep up with those high standards. Now let me tell you some words about the limited edition: the digipack edition of this album was advertised with two bonus tracks, so I bought this one. I wouldn't miss two more songs, but what the band presents here as bonus tracks is a mockery: you get two boring instrumental tracks that are two to three minutes long (each one of them). WTF?! I really felt ripped off here and thought this is a bad joke. So, this is a warning to all of you: don't buy the limited edition, you don't need it! You just have to pay more money for nothing. The standard version of this album is sufficiently. Oh Elvenking, what did you do with this album? The overall-impression is very disappointing to me. I thought I could buy this one blindly, but that was a mistake. I just can recommend you to listen first and then decide. I'm sure fans of the early Elvenking-era will get what they are looking for and also every Pagan Metal fan should give this album a listen. "The Pagan Manifesto" is a powerful record, which shows Elvenking from their heavier side, but instead of some remarkable, anthemic Power Metal jewels, it offers a relapse into old behavior patterns. "I still love the voice of singer Damna, who sounds better than ever on this record - he could easily sing on a Sleaze Metal record, because his voice has this special dirty attitude, that makes the songs more interesting"
Damna's other band is Hell In The Club.